Must the bris be performed on the baby's eighth day? What if the baby is ill? For the sake of convenience can the bris be delayed to Sunday? Does a bris require a minyan (a gathering of ten Jewish men) present? If the baby's mother is not Jewish can he still have a bris? What steps can be taken to alleviate any discomfort during or after the procedure? What are the honors at a bris? Is it appropriate to appoint godparents? We want to name our son after a family member. Can we name him after a female relative? Does a bris require challah or wine? What kind of festive meal is appropriate at a bris? Do we receive some form of documentation certifying the event? Of what value is this certificate? Performing the bris on the eighth day is a Biblical requirement that is emphasized two different times in the Torah. It is therefore of paramount importance. Of course, if a child is ill, the bris has to be delayed because there is nothing as important as the child's health. However, once the child is well and has been given the medical clearance to have his circumcision, the bris should be performed as soon as possible. Some people would like to have the bris delayed to a Sunday for convenience, however, this is not really appropriate. You will find that true friends and family will come to the bris whenever it is performed. A bris is more than a medical circumcision, hence the religious nature of the bris is significant. It is a blessing for the child to start his life properly. It is nice to have a minyan at the bris, but it is not required. A minyan is required at a public function such as praying in a synagogue or the reading of the Torah. A bris is considered a private family affair. Please see the description of the circumcision ceremony for more details. A baby whose birth mother is not Jewish can still have a bris, provided that it is performed for the sake of conversion. 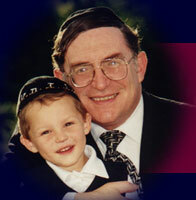 This conversion process is initiated at the bris and is culminated with the family's rabbi at a later date. There are creams and ointments that are available that will help alleviate some of the discomfort of the bris. A baby's crying should not be mistaken for pain. Many babies will begin to cry as soon as they are being held by the sandek. Rabbi Krohn carries these creams with him and uses them upon request. For items you will need to prepare for the bris, please see the bris preparation section. For a complete list of honors please refer to the description of the bris ceremony. In Judaism, we do not have godparents where there is a responsibility assumed. Rather, the term godparents is used loosely for the people who present the baby at the bris. A little boy can be named after a grandmother, aunt, or any other female relative. Of course, when a boy is named after a male, the exact Hebrew name is used. When he is being named after a female, the most appropriate thing to do is to use as many of the Hebrew letters of the woman's name in naming him. For example, if naming after a woman Malke, the boy's name would be Melech, which has three common Hebrew letters (mem, lamed, and kaf). If he is named after a woman whose name was Rochel, a suitable name would be Refael, which has two common letters (rais, and lamed). For help with choosing a Jewish name, please see choosing a name section. Does a bris require challah or wine? What kind of festive meal is appropriate at a bris? It is traditional to have challah at the bris, but it is not necessary. However, wine is required as it represents happiness and is part of the ceremony. Many people erroneously believe that wine is given to the child to reduce the pain. This is not so. The baby is given a touch of wine after the bris so that he too shares in the joy of the bris ceremony. At every bris Rabbi Krohn issues a certificate that has the baby's Hebrew and English name, Hebrew and English birthdays, and a place for the participants to sign. This certificate will serve as a future reference, for example, in determining the correct day of his Bar Mitzvah. IF YOU HAVE ANY FURTHER QUESTIONS, DO NOT HESITATE TO CALL!